Apologies in the delay in this blog, I have been putting it off because I literally don’t know where to start as it has been a very busy and eventful summer! I had a slight injury during my preparations for the under 20 Nationals in June, I strained my hamstring which meant that I had to miss this competition. The UKA physio advised me not to race on it because it could potentially make it worse. 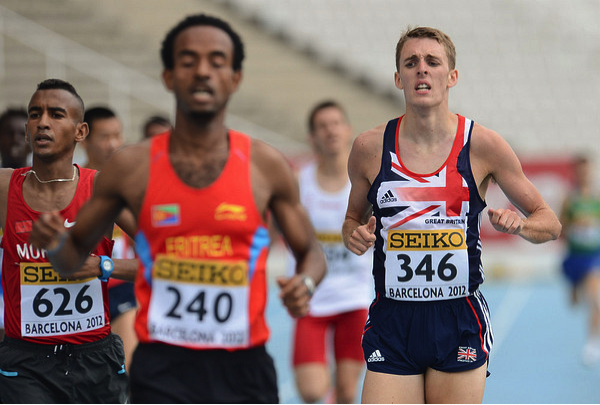 Fortunately it still meant I could be selected for the World Junior Championships because I was the only athlete in the country with the qualifying time for the 1500m. It just meant a week of no speed work, which wasn’t ideal preparation for the Olympic Trials in Birmingham which were a week later but it turned out to be a blessing in disguise! Once the heats were announced, I found myself to be put in a tough situation. There were four heats of the men’s 1500m, and I was in the first one. The qualification procedure was top 2 in each heat go through to the Final, plus the four fastest losers. Mo Farah was in my heat, and so were Brewer and Whiteman, who both have quicker PB’s than me. I knew that I had to secure a top 2 finish to qualify and therefore needed to treat this race as the Final! The race started off really slow and cagey, everyone was eyeing up Mo and waiting for him to take the lead, but he just waited and waited. It got strung out with 700m to go and I was patient sitting in 4th place, with 200m to go. I finished like a train and was chasing Mo down the home straight whilst he did the Mo Bot! It was a fantastic experience for me; I came second and was really happy with my performance to make my first senior outdoor final. I had made the Olympic Trials Final and I was delighted. The top three finishers in the final would make the GB team for the home games, a lot was at stake and I was really pleased to be a part of it. I was really pumped up for the Final, no- one expected me to qualify for the final, although I expected it of myself because of all the hard work I have put in this Summer. The whole experience was really new to me, and I was loving it! I seem to thrive on the big races and feed off the large capacity crowd who really get behind the athletes. The final came around quickly the next day, which was live on BBC 1. Unfortunately Mo had decided not to run in the final which ended up being another slow race and being physical with a lot of pushing to get the good positions. I found myself boxed in the inside lane at one point but managed to move out. With 600m to go I was in a good position but suddenly about 4 guys overtook me from all directions injecting a sudden burst of pace, they took a few yards on me instantly and I was blocked off by other people like me who were caught out with the kick. The guys at the front did the last lap in 52 seconds which is very typical in a slow race. I finished in 8th place, which I was initially disappointed with because tactically I didn’t run very well. However when I put the two performances over the two days together, it was good work. I ran my hardest in the heats and it took a lot out of me. Above all, I am learning a lot from these experiences. A week after the Olympic Trials, I was off to Spain to prepare for the World Junior Championships in Barcelona with my coach Jon and my training partner Joel. My friend Joel has a place 1hr away from Barcelona, he kindly let us use it, and it was a perfect place to train and chill out. The track was a mile away and there were a lot of dirt trails near the apartment which were perfect for running on. It was great to get out there and focus fully on the task at hand and also acclimatise for the Championships. Last year in Estonia temperatures soared up to 34 degrees which caught most of the team out because we weren’t used to the weather and subsequently underperformed. We were not prepared to let this happen again and I entered the team camp full of confidence for the start of the Championships. I was one of the first people to compete on the first day. Looking at the start-list for my heats the night before, there were 3 people quicker than me, from Kenya, Eritrea and Morocco. The qualification procedure was the first 3 in each heat through to the Final plus the next 3 fastest losers to progress to the final which would be two days later. As always with the heats you cannot be over confident, I knew I must be prepared to run a personal best to qualify, especially being 4th fastest in my heat and with only 3 guaranteed to qualify. I anticipated the race to be fast because I had 3 Africans in my race who are notorious for leading the races out in a fast pace. Unfortunately for me this was not to be the case with the pace being pedestrian and it being quite physical jostling for position. It was going to be a kicker’s race and all of us were confident of our fast finishes. I was always in a great position, sitting on the leaders which is what we had planned. With 500m to go the wind-up began and we shook off most of the competition, and with 300m to go it was a full-on sprint to the finish, with myself getting caught out on the line and finishing fourth, all within half a second of each other! I was devastated because it wasn’t a true reflection of the shape I was in. I was confident that if I was in any of the other heats that were even paced I would have qualified. I had high expectations of aiming for a podium finish at these Championships and it was tough to take as I only narrowly missed out on the fastest losers slot, being the fourth fastest loser and missing the final by one place. Back at the warm up track after my cool down and feeling very sorry for myself, Jon thought that I needed another race as quickly as possible to get the World Juniors out of my system and take out my anger on! He managed to get me into the Crystal Palace Diamond League and this was a good consolation prize for me. I jumped at the idea and felt that I needed to redeem myself. Unfortunately it meant that I had to leave the GB Team a few days early including missing the after party to get back to London in time for the race! I left two days after my race to get there two nights before the Diamond League in order to give me enough time to get over the flight and to get myself organised. I was to run in the Emsley Carr Mile, one of the most prestigious mile races in the Athletics calendar. I had never run a mile before, so it would be a really good experience for me and I was to be facing the likes of Bernard Lagat, Nick Willis, Leo Manzano to name a few. I was targeting a sub 4 minute mile which is a benchmark of world class running first broken by Roger Bannister in 1954. I was on the start line with some of the best athletes in the World. After the disappointment I had experienced in Barcelona, I really wanted to put in a good performance not only for myself but for Jon my coach who has put in so much of his precious time and thought into my training throughout the year. Both of us knew what I was capable of and now was the time to prove it! I slotted where I belonged near the back of the field and tracked them through, keeping an eye on the pace that I needed. I went through 800m in 1min 56, way on schedule. I tried to stay with them when they kicked on for home, over taking a few on the back straight, the last 150m was tough, I dug deep and crossed the line in 3:57.90. Because it was a Diamond League they took a 1500m split during the mile, my split was 3:41.0, breaking my PB, two PB’s in one race! The mile time put me third on the UK under 20 All Time List, ahead of Steve Ovett but just behind Steve Cram. It also took nearly two seconds off Ovett’s thirty- eight year old Sussex under 20 Record. That put a big smile on my face! With the disappointment of the World Juniors, I was still motivated to carry on racing as I knew I was in the shape of my life and I wanted to capitalize on that. I ran an 800m PB in Birmingham a week later, beating my personal best by nearly two seconds. This time has put me first in the UK under 20 men’s rankings and seventh in the UK Senior men’s rankings. The moral of this blog is that failure is the greatest motivator.